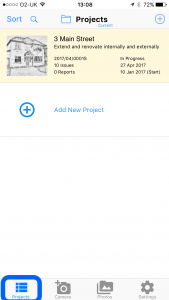 Site Report Pro allows you to add and store multiple projects. Projects are used to capture, manage and report all issues of a site inspection, site audit or safety inspection. Issues can be a snag or problem that needs to be resolved, or a task that needs to be completed. This collection of issues is often referred to as a punch list. 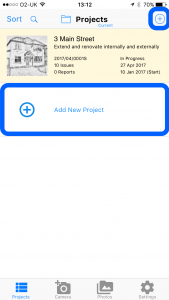 Click the Projects tab at the bottom (if necessary) and then click Add New Project in the project list or click the Add (+) button at the top of the screen. 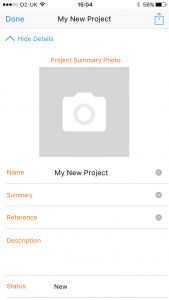 Enter a name for the project in the box that appears and click done. 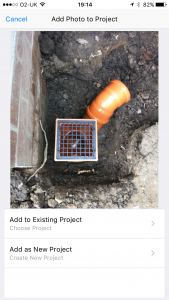 Click the ‘Add Project Photo’ button to add a photograph for your project and enter the project information such as summary, description, status, client information, auditor information, etc. Click Done when you are finished. The issues screen will then be displayed allowing you to start entering your issues. Tip: If the same auditor information is to be used for all projects, then the auditor name and company name can be set in Settings -> Auditor (Defaults). 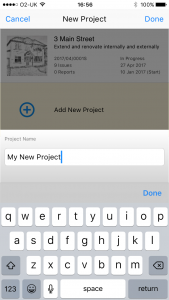 It is also possible to create a new project immediately after taking a photo or browsing your photo library within the App.